Greetings Make It Happen newsletter subscribers. It has been a long time since I've been in touch because I've been working on my second book. 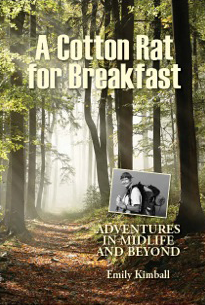 I am happy to report that I recently completed A Cotton Rat for Breakfast: Adventures in Midlife and Beyond, my memoir that covers my life transitions between the ages of 45 and 84. Adventurer Emily Kimball's new memoir is an inspiring account of her fascinating life, focused on the transitions she undertook over the last four decades, from ages 45 through 84. The entertaining and insightful memoir traces Emily's transitions from when she resigned a well-paying but unsatisfying job, arranged for her children to live with their father for a year, and headed off on her own to train and search for a new career in environmental education. Along the way she faced many challenges--hiking alone to the bottom of the Grand Canyon, paddling a canoe for over 200 miles on Florida's Suwannee River, and attending a 10-day survival trip in Utah with only a knife, a toothbrush, an extra pair of socks, and the clothes she wore. In pursuing a job hunt across the country, Emily interviewed with 60 environmental agencies. Traveling in search of work on a very limited budget, she camped out and cooked meals, enduring anxiety about her future and that of her children. After arriving home empty handed, she worked 10 part-time jobs over 12 months before securing a permanent job in her new field. Other transitions covered in A COTTON RAT FOR BREAKFAST: ADVENTURES IN MIDLIFE AND BEYOND include Emily's early attempts at becoming a professional speaker and a writer-often amusing--and her bike tour across America and her Appalachian Trail hike in retirement. This collection of stories is a must-read for anyone who has ever pondered stepping out of their comfort zone. It is a source of inspiration for people in midlife and beyond, helping them to take risks, explore new directions, and move ahead after failures. To give you a deeper sense of the book, I will share a few highlights. On December 5, 1976, I made a decision that changed my life, resigning my high-paying job to enter Virginia Commonwealth University as a full-time special student in biology to train for a career in environmental education. I arrive at Indian Garden campground and hike to the edge of the gorge cut by the Colorado River. The roar of the river is deafening--the trees below tiny specks. A mountain bluebird perches on a bare tree limb. Its icy-blue color sends chills down my spine. This survival expedition is making me a little anxious. What am I getting myself into? Can I manage in the wilderness for 10 days--capturing my food, whittling my utensils? Will I be able to stay warm? I arrive at the meeting place in Blanding, Utah. Ten wild-eyed guys with tangled hair and filthy clothes greet me. During my cross country job search, I visit over 60 agencies in the outdoor field. Environmental leaders spoke with me at length--often giving me leads to key people, who might have job openings....I am beginning to realize that I may return home empty handed. Then what will I do? Will all my work to change careers be for naught? I love my job as Outdoor Manager for a Parks and Recreation department, but I am feeling the need for a break from its intensity. I am slowly burning out and losing some of my initial enthusiasm. I ask for a sabbatical. Will they grant me one? I look forward to hearing from you - and getting your feedback on this new work.